Ireland are facing an anxious wait on the fitness of fly-half Jonathan Sexton and Donnacha Ryan ahead of their match with France on March 9. Sexton sat out Ireland's 12-8 loss to Scotland due to a hamstring injury with Ulster's Paddy Jackson deputising. There were hopes that Sexton would be fit in time to face Les Bleus but, according to team manager Mick Kearney, it looks unlikely that he will be fit in time. "Jonny continues to make progress. He's back running this week but to reach match level intensity there's still significant work to do," Kearney said. "At this stage we are more hopeful than confident of his availability for France. We would say it's somewhat less than 50-50." Lock Ryan is also a doubt after incurring a shoulder problem at Murrayfield, while his second row partner Mike McCarthy continues to nurse a knee problem. The prognosis over Craig Gilroy's groin complaint is better, however, with the Ulster wing expected to train next week. 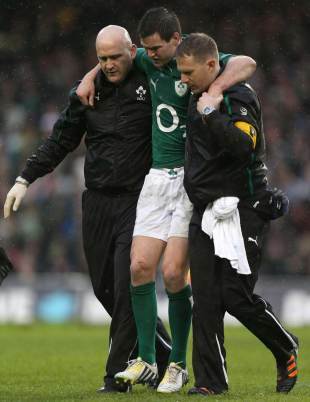 "Donnacha suffered a bruised AC joint. He won't take part in training this week and will be reassessed on Monday. At this stage he is in some doubt for France," Kearney said. "Mike is running well and is improving, but he has a number of milestones to reach before being available for selection. At this stage we'd rate his chances of being fit at 50-50. "Craig Gilroy suffered a groin strain but scans excluded a tear. He continues to improve and should train fully next week." Ireland will go into their match with France off the back of defeats to both England and Scotland. With Declan Kidney's contract up after the Six Nations, reports in the Irish press claim it is increasingly likely that he will leave his post as Ireland boss. But despite the increasing pressure on his position, Kidney is adamant that he is focused on just France and not the wider picture. "I haven't been thinking about that. My only concern is to help this team do as well as they can do. That's my reason for being here," Kidney said. "We have a match against France next weekend and that's all I'm concentrating on. "There are huge highs and lows that go with this job and last Sunday was a big low, especially after having created so much." The erratic leadership of Jamie Heaslip, who replaced Brian O'Driscoll as captain before the championship has also come in under scrutiny but Kidney has backed the Leinster No.8. Kidney added: "I'm aware there are frustrations out there. Jamie's done an excellent job for us. He's making good decisions and I'm very happy with him."